It is also 20mm squeezed in scale Gunnar. They Government are talking of banning the production of plastic drinking strews in Britain. This picture of the Waterloo battle is very interesting indeed. It shows Lord Uxbridge to the far left of the picture siting on an animal skin, wearing his Shako covered over in gold, and with a fine mustache! Here he is siting on a Tiger skin. My first post using a new P C. Very awkward finding my way around it. A Troll blasted my other one complete Kaput! Warning Trolls coming in on Facebook advert Links to EBay!!!!!!! " ! sdretsab"
The Hard-drive is to be melted down at a local foundry. 7 Sprues of Prussians one being a Command sprue. French 4 Sprues off each. Plenty of heads to choose from. As i awoke to Saturday with the rubbing of my eyes, i hoped my long overdue mail would arrive. When i order from E Bay,i usually get whatever it is i have bought in two or three days. Buying on line elsewhere 8 or 10 days.However by not buying on E Bay i saved a cool mint of £30.00 which meant i could buy another two boxes. It was at this point in time while I was typing this,that cheerful Mailman arrived,`Thank you good sir,' i said as he handed me the stash of bubble wrap envelopes all of differing sizes, ` You have a good day.' __` And you too.' he replied as he closed the small gate set into the wooden arbour, and set out to the next house in the tiny courtyard of stone slabs where we live. The largest envelope being the one containing figures in 28 mm scale. The British Light Cavalry Horses from Perrys. £3.50 for three horse. These will gallop around and be very useful for those having no nag at all. I bought three kinds of Sprues from Perrys costing £1.00 each. One sprue were of dismounted French Dragoons, and the other British Riflemen,which can serve as The Kings German Legion. As you can see two figures one totting the firearm the other firing one. Each sprue works out at 50p each. Well the sun is out and Mrs B,is gardening and I`m off to join her with ice-gold ice-creams in me mitts. You made good deals! I hope you had a sunny sunday like me! have an added two surprises to them, and one many may not like. I used two cameras so there is a subtle change to the pictures seen below. The Old Guard come in a plastic sleeve. This I do not like because I like to have boxes. There are four sprues in each containing 15 figures and bearskins these fellows wore all in a row. "How on earth did they keep them on their heads without them having a chin strap?" there are four rows of shakos in the box. ! ! ! ! ! The reason for doing my odd reviews was to show the pitfalls of buying certain Kits,and so in light of these two in review, one could just buy the Middle Guard Set and settle for 30 each of Old Guard and Middle Guard,and by doing so halve the cost. My favourite spot for overthinking and sinking head long into confusion. The instructions!
" I remember when BB, put up a fantastic looking shelf upon the wall, trying hard to follow the instructions. "__ " but sadly the plans were for a coffee table!" This kit arrived too,which has the 8 and 12 Pounders inside. It gives three choices of Artillery Regiments. The Old Guard being one wearing the bear skins. There are three sprues containing the guns. There are three sprues of figures to the Set that comes in a plastic sleeve. Heads and arms with a few tails to follow. Lettered and numbered parts guide one to model their choice of Gun Crew. "This will serve to confuse BB,no end. "___ " Yes I can picture it now Pards, Gunnars with two left arms stuck on em. "__ " And two right arms stuck on others." " it is an age related thing i guess?" Pictures taken from VICTRIX,but I highlighted one as it was way to dark. Buying the two Kits of Guns from Victrix certainly paid off ,because there certainly is a much wider choice of ordinance to mount,they being three of each of these 6,8,or 12 Pounders and another option of three 6 Pounder Howitzers firing explosive airburst shells. Now concerning Prussian Guns,there only appears to be metal ones with gun crew. Which is a something not on my list. Concerning that list I had in my head it is for the most part tipped out here. The Black Powder Prussian Landwehr I am not buying because I like my troops wearing boots and not bandages on their feet. It is simply a boyish toy soldier thing, and not a slight for the poor sods who had to endure such a thing in real life. However I decided to show those brave young and old guys here. Your collection is getting more and more impressive. Great show! I like the Landwehr, also the boxart. Now when are you going to paint them? 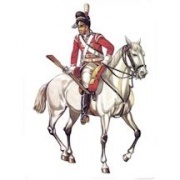 Perry miniatures have some new British Light Dragoons coming out in June of this year which look an awesome sight. Sorry no pictures but follow the Perry Link provided to view them. To address the question on painting some. I will have to shorten the time I spend upon my other hobbies about the house to buy out time for painting. Perhaps I will have to pick out one day of each week for painting? It is a tough call to make now the sun has appeared. Yes I`m back with more infantry. This old boxed Set is out of stock at War Lord Games. Well they need to sell their newer one that has bandages on the feet. I managed to buy a couple of boxes of the Prussian-Landwehr above that have footwear! This Set also contains a three figure command set of metal figures. A drummer and two Officers. The boxed Sets being out of stock I also bought 8 sprues at £2.50 each that come from the Boxed Set above. That gives me quite a Landwehr Battalion to field quickly as they are complete figures that can be painted with no fuss or bother. I`ve seen these painted on You Tube and really like them. This picture was copied on Line, however I do happen to own the four volumes of rare books where this picture is from, and I will take time out soon to thumb my way through them. and they are from the boxed Set above thus giving another 35 Prussians to bolster up Bluchers army. As I embarked upon this journey of collecting more 28mm Napoleonic figures, i aimed to get bargain prices and for the best part I have, but I realised that soon I`d reach the point where marching columns of toy soldiers would need firing support from other units that quite frankly are very lacking in availability at present at bargain prices in the world of 28mm figures. This is a wide open doorway in the market place of plastics that needs filling. Yes there might come a time to dot a few metal Guns around and for me to bite the bullet as they say,but not yet on this quest. In order to get firing lines to support the advancing Prussians I have relied on HAT to give good value for my money plus Perry Miniatures extra figures for skirmishing riflemen. At £7.84 for a box from HAT ; of 32 figures it gives a good solid line of 8 firing , along with loaders and other action poses. Now I`ve been looking at Perry Miniatures and Front Rank metal figures and both their firing line of 6 figures are £7.50 that equals £1.25 each. Brilliant figures true. 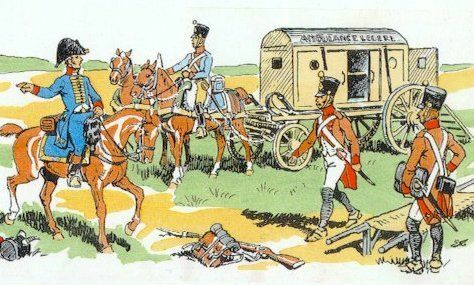 At Front Rank I can buy individual firing poses at £1.25 so eight would cost £10 for 8 Prussian , 8 Nassua,or French and so on. However turning to plastic again HAT has won my order, and so I have bought extra boxes of Prussian action poses,because I receive in exchange the volume of extra poses ,32 in a box at pocket money prices. I often think of the children that collect their own model soldiers and have to do so upon a fixed amount of dosh! ` That sounds good Pards!' ____ " It most certainly does ." With a glint of cold steel in the sunlight the new blade was taken out of its oiled up container and carefully wiped with a fresh piece of soft kitchen paper and then loaded into the trusty craft knife. The story continues after this. Today I restocked two shelving units with the recent result of my collecting addiction! I still have others mainly cavalry to jam into place somewhere too. While my Mrs B,popped along to the Post Office,i settled down to scratch building with the aim of having a very constructive day, when yes yet again I cut my darn finger next to my pointing one,and on the same right hand that held the craft knife. Eventually i sorted the daily mail, some of it now bloodstained, and then typed this. I guess I wanted you to suffer too in the reading of it. Nee nah nee nah nee nah! I always keep the Band Aids close to the Exacto. 28mm isn't my thing but you've shown us some really nice figures here Paul it's been interesting to see them. Of course I have those same Prussian Infantry Action figures in 1/72, I really like that set. Thank you Gunnar,that was not the end, but the end of my plans for that day. End never insight until the last post along with the tune of lone Piper upon the castle battlements are sounded. I hope someone will post a public service announcement board with illustrations on the safe use of hobby knives in this thread for the benefit of our dear BB. In the meantime I'm checking the availability of Elastoplast shares. It was very interesting how I came to cut my finger. I used the worktop in the kitchen,and placed a cutting mat to protect the expensive top. I moved Mrs B`s radio aside onto her journal: a book kept by her of daily deeds and accounts. This book of recorded things is sort of wedged open as important documents get shoved into it every day the mail arrives throughout the year as the year unfolds. So it now being halfway through May there was lots wedging the book cover up. So the radio sitting upon it was like a ship ready to be launched into the sea. The paper card was way to wide and long for the worktop area I had available to me really, and I should have cut the card smaller, but being a big boy in a hurry of course I knew better. So I began to cut out my first needed shape of my day. All went well until I turned the card to get a better angle with the flashing blade,when I nudged the journal and the radio being a rather large long white one slid off onto the other end of the card forcing it up as I was making my cut at the other end. The result was the blade sliced into my finger that always supports the knife. Looking on the bright side of all this,as the paper card became unbalanced I saved the radio from crashing down to the stone floor below with my left hand quick draw.
" I taught BB, that." ____ "You most certainly did." " bb`s finger although being a bleeding nuisance at first." " is doing throbing`ly well as can be expected. " " And the journal is still being wedged open." " While the radio the cause of all this sings away, quite unconcerned." When can we see the next episode? To answer your question Peter, this day as it unfolded saw me reporting for duty. Which called for a while sticking French Dragoons and The 95 th Rifles together. It is very fiddley indeed fixing the straight swords onto those Foot Dragoons. I managed four from each set.
" BB, spent more time picking up the tiny pieces from the floor." "A devilish occupation to be sure." The aggressive Scots Highlanders above join the British ranks, and these Victrix figures sure have the faces to match the rough tough lads under General Picton`s Command. The famous painting shows how they hung onto strap or saddle cloth at Waterloo. A method of support oddly overlooked by movie makers and historians alike. I have only ever seen it in the TV Movies of SHARP and his chosen men of the 95th Rifles.